To conceive an album trilogy is certainly ambitious, and I can’t think of many besides the Melvins trilogy released in 2000-2001. And given that it was a full five years since the first instalment, Mrtav (Croatian for the word ‘Dead’), the scheduled 2020 release for what Croatian avant-garde/sludge/post-metal band Hesperian Death Horse state will not only be the conclusion of the trilogy, but their last album, also seems ambitious. Ambition is a good thing, and there’s a lot to be said for having some kind of master plan – although what matters is having the ability to back it up with an execution that does justice to the concept. The concept in this case is – appropriately for a band whose lifecycle will be represented by these three albums – the cycle of life, delivered in reverse order, with ‘Ziv’ being Croatian for the word ‘Alive’, and the final piece being ‘Rodjen’ (Croatian for ‘Born’). 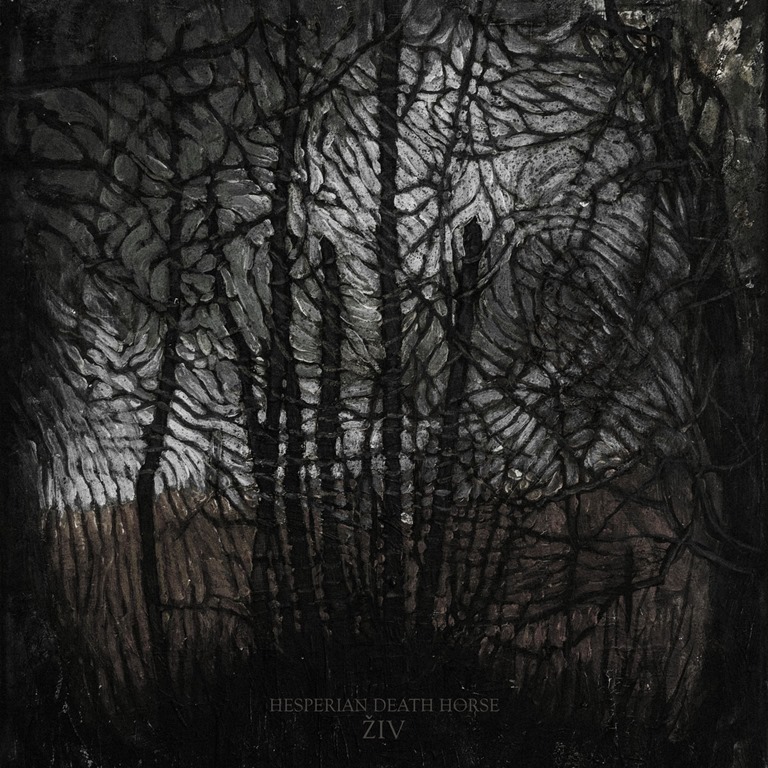 Hesperian Death Horse is more than a band: they pitch themselves as ‘a narrator of psychedelic, nihilistic poetry that sings a saga of the birth, life and death of every being’. It’s quite a claim, and ordinarily Id scoff at the elevated level of pretence… but this is good. Ziv is one of those albums that contains just four tracks, which, if released on vinyl, it would be a double with just a track on each side. The first of these, ‘Saol (Part 1: Prizma)’ has a running time of just under ten minutes and is indeed epic in every sense. An echoed, chiming guitar warps and bends into dissonance through the awkward and intentionally ‘wrong’-sounding opening passage, gradually and gracefully building while maintaining an undercurrent of discomfort. Sibilant voices chant low in the mix as a squall of noise and a rhythmic throb jolts… and then its gets really dark. It may be about life, but it doesn’t exactly feel like a celebration of fulfilment: if anything, it’s closer to Filth era Swans: discordant, bleak, jarring, nihilistic, a sonic representation of the grind of life on the treadmill of existence. The claustrophobic entrapment of work and sleep, that vacant, hollow life that isn’t really life, but is life as so any of us have come to accept it. Don’t look to the second track, ‘Elu (Part 2: Voda)’ for light relief, either. More skewed guitars slant across a woozy, gut-churning bass and loping rhythm to forge a dense, murky backdrop to the impenetrable lyrical incantation, delivered in a bitter-edged monotone. It’s a dingy dirge of soul-crushing proportions. ‘Hayot (Part 3: Mezanin)’ is – incredibly – even slower, dirgier, more oppressive, the blank vocals the sound of defeat. The bass thuds relentlessly, while the guitars shiver at skewed angles across the solid underlying structure: it bleeds into the final song, ‘Liv (Part 4: Horde)’ – and it’s intense. As the pace and intensity build, things go haywire and a sustained crescendo of chaos emerges. And still, the vocals remain blank, impassive, giving the whole searing blast an air of detachment and dislocation. It’s a fair representation of life over the long-term: stripping out the peaks and troughs, it’s a long, bleak and relentless slog of an album. Yet for all that, it’s intensity and sonic force create a kind of gravitational pull that drags you in. Feel the force, and surrender to it. Yes, this is life.